You may remember this past spring when my colleague, Shoshana Resnikoff, wrote a blog post about May Morris’s Bed Hangings in celebration of her birthday. Well today on the blog we take a look at her father, William Morris (1834–1896), designer, poet, novelist, socialist, translator of Icelandic sagas(! ), and all-around creative visionary who shaped the Arts and Crafts movement in England and its many iterations throughout Europe and the United States. Pimpernel, designed 1876; Lily and Pomegranate, designed 1886. –William Morris, “The Lesser Arts,” in Hopes and Fears About Art, 1882. Cranbrook Art Museum holds seventy-two wallpaper samples in its collection, which were donated by Mrs. Olive Hansen in 1991. Peter Heinrich Hansen, Mrs. Hansen’s father-in-law, was a German immigrant who in 1904 was hired as a designer-draftsman by none other than Gustav Stickley, one of the American Craftsman style’s greatest furniture makers (and like Morris, an ardent socialist). When Hansen and his wife Ruth, who herself worked for Stickley as an architectural draftsman, were redecorating their home in upstate New York, they ordered wallpaper samples of every pattern made by Morris & Company–the design firm founded by William Morris–and never threw them away. 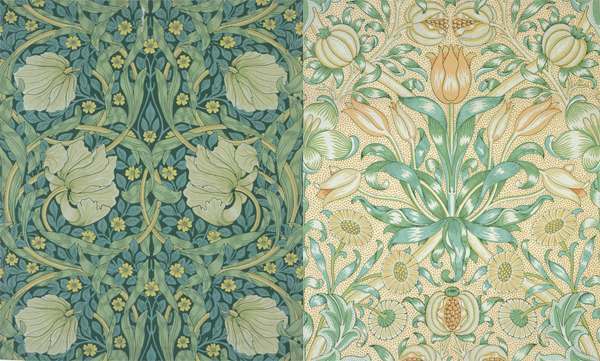 You can read more about the design, implementation, and social context of William Morris’s wallpapers on the Victoria and Albert Museum website. And for more on Morris’s influence on George Booth and the foundation of Cranbrook, you can check out this great gallery guide written by a former Art Museum fellow, which I’ve scanned and uploaded here.